Discussion in 'Transformers News and Rumors' started by MMarker, Aug 23, 2010. Why flip-out sunglasses? I'm not familiar with the character. There was a scene in Transformers: The Movie where his flip-down "sunglasses" let him zoom in on something like binoculars. To my knowledge, this was the only time this feature was used. It seems like a thoughtful, fun, and unobtrusive gimmick to the toy. Cool. My question: the visor was only ever seen with Hot Rod, so does this imply he DOES have a Hot Rod mode for sure? In the original animated film Hot Rod debuted in, the Decepticons hijacked an Autobot shuttle on it's way to Earth. Daniel (Spike's son) and Hot Rod go to watch the shuttle land. Daniel notices it's been damaged and Hot Rod flips down this binocular-like visor that lets him zoom in to check out the shuttle closer and see the Decepticons inside. It's not a major thing, but it's memorable. Well, there are certainly some things we're not seeing, like what the gimmick in his gun is that clearly exists. I hope they just come out n say "Yeah it's going to be hot rod too" That'd make me so much happier. NicE~! Not sure how tall G1 Rodimus is. 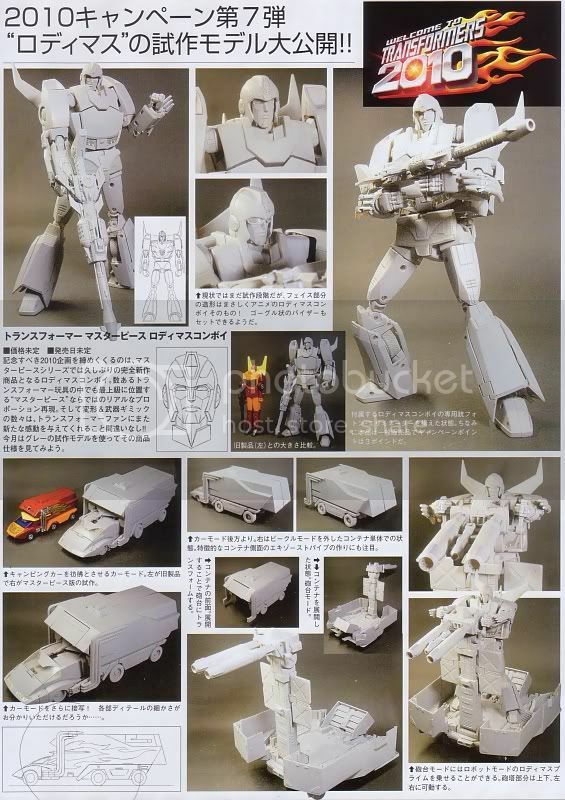 Does this mean MP Rodimus is about 12"? Regardless, This will be the next TF that I buy! Pretty sure there's no reason for RODIMUS PRIME to have flip-down goggles. They're gonna be really slow about revealing all his secrets. QUICK, SOMEONE PUT A PICTURE OF G1 RODIMUS PRIME NEXT TO MP PRIME AND MP GRIMLOCK!!! i can't wait to get this, and won't they show us hot rod already! Damn! To get this of the FP version? Maybe I will just wait until the Hasbro release and get both. We've been over the tire thing. We discovered pretty much the entire car mode on him, except for the engine. So pumped for this figure. Hell yeah. my day has been MADE!!! That trailer looks incredibly boring, but I'm totally digging the hands and body lines. Moar info would be nice. It's odd that in those pictures the spoiler can't slide up more for alt mode despite there being a massive slit in front of it. I don't know if I can justify $200 for this if the trailer is so meh.